So, I Decided To Have Messy Hair (aka Dreadlocks) – this luminous life. June 5, 2013 ~ Laura N.
Over the past few months, I was seriously considering having dreadlocks. My thought process was more like, “When I can quit my job and write to earn an income and be a stay-at-home mom, then I’ll dread my hair. That way, I won’t have to worry about jobs.” So, it wasn’t something I saw in my immediate future. As weeks went by, I realized I shouldn’t put off anything because I was waiting on something else. “Someday” wasn’t good enough for me anymore. What if I waited on the hair because I was waiting for a job and the job never happened? What if I don’t have kids until much later? What if someday never came? No more what-ifs, in either direction. I decided that for my 27th birthday, which falls in early June, I’d start the dreading process. After some more consideration, I moved it up to June 1st. I kept this kind of quiet and only shared the decision with few people. Um. What. WHY!? Why would I subject my hair to this? To be brave and try something new. I always felt like I had to ‘fit in’ and ‘conform’ to whatever my parents/friends/jobs/society expected me to look and be like. Recently, I’ve felt a shift in my soul as I’ve been letting go of this lie. I am the only person holding me back from anything – no one else. 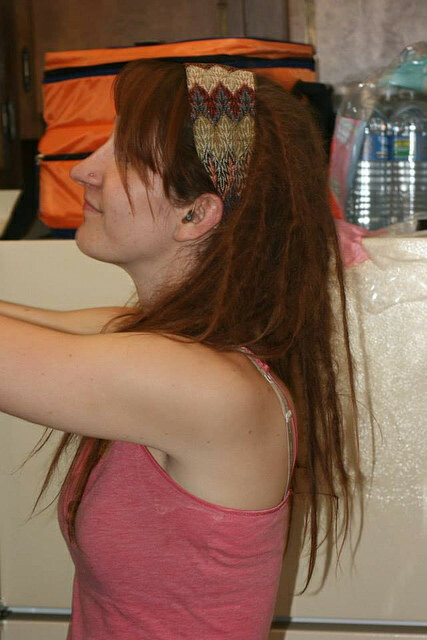 Getting dreadlocks was something I never considered because I was so afraid of… something. Not being able to get a job? People looking down on me? Something. But I’m not afraid anymore. Take care of my hair in a ‘natural’ way. I started washing my hair with baking soda a year or so ago. When I dyed my hair earlier this year, I stopped using the baking soda and switched to a shampoo for color-treated hair. Then I realized that wasn’t what I wanted and switched back to baking soda, which stripped the color out of my hair. Argh! Hair maintenance is exhausting and the idea of leaving my hair to become adorable on its own while decorated with cute wraps was more and more appealing. To learn (and teach) acceptance, patience, and commitment. Let’s face it – we are judged by the way we look. Dreadlocks will cause people to stare and judge. I know. I’ve been one of those people. Now, my heart will be more open to others and hope others will open their hearts more. Dreads are also a long journey that requires patience and commitment. Spiritual reasons. Jesus walked with anyone and everyone. Jesus advocated non-conformity. Humility. Acceptance. Patience. Love. And more. All of these are solid spiritual aspects that I want to work on. I believe that this journey with my hair will bring me close to God in some way. I know that sounds kind of odd, but I don’t care. It will also keep me down-to-earth. I have learned a lot about myself in the past few months as I’ve considered and had dreads (OK, they’re baby dreads right now). Letting go. Letting go of vanity. Letting go of control. Letting go. I think they’re cool! Period. 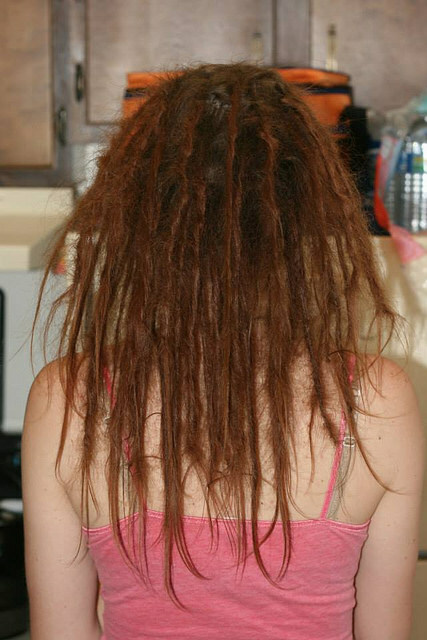 I’ve been drooling over beautiful pictures of dreaded hair and it didn’t take long for me to think, “Hey! I could actually do that!” Plus, every dread is different. Every head is different. It’s fun to see how different each person’s hair forms. Am I concerned about finding a job? A bit. Will people in my church think I’m odd? Perhaps. Am I worried about what my parents think? Maybe. Do I care how strangers view me? Not really. Will it be OK? Yes. On the first day of June, I woke up early with excitement. I showered, ran errands, and spent precious time with my husband. In between all that, I was hooping. Constantly hooping. I had so much energy and nervousness and excitement in me that I just had to get it all out! Hooping, hooping, hooping. So thankful for my hoops. After a few people showed up at my place that afternoon, we started the process (simple backcombing and twisting/rolling without any products) around 4pm. It lasted until 9 or 10pm, with at least one person working on my hair at all times (except for bathroom and food breaks). It was amazing. I loved having all these wonderful people in my home (some present in spirit! ), weaving their love into my hair. We played, ate, and laughed. We enjoyed each other. I feel so blessed. And there you have it, my baby dreads. They’re done. No turning back. At the time of this post, they’re four days old. I washed them for the first time this morning and they stayed! I was actually afraid that would come apart in the shower, for some reason. I do wish that some of them were thicker, so I may end up combining a few later and fixing up some of the ends. I was a bit disappointed at how thin some turned out to be, but my hair is pretty thin and this way it’s done without huge gaps between each dread. We’ll see how they progress. Whee! We are our own worst enemy. We are typically the one that hold us back from being our most authentic. Go for it. Ride it out. Confront yourself. Confront others. So true, and such a powerful thing to know. YEAAHHGIRL! 🙂 I love dreads too. Enjoy the journey! Did you buy the special wash or will you be washing them apple cider vinegar? Are you using beeswax? Details, details 🙂 I have a hard time growing my hair out (I love having short hair), and every once in a while grow it out with the intention to dread it…but end up chopping it off instead. But every time someone embarks on a dread-journey it gets me thinking again 🙂 Inspire on, beautiful soul! Thank you for your enthusiasm! :DSo far I am just washing with diluted baking soda & an essential oil (usually peppermint). It seems to work. I may add an apple cider vinegar rinse if it seems that I need to do so/someone suggests I do. I refuse to use any waxes or ‘dread’ products as those can cause the hair to become more dirty, etc. Natural is the way to go! Pingback: Three-Year Dreadiversary! | this luminous life.